…AND ON THE DRUMS – GUNSON! Specialist car maintenance is easier when you have the right tools for the job. Working on drum brakes means often relying on a brake adjusting tool before they can be pulled free for maintenance. This Brake Adjusting Wrench from Gunson (part number 77152) features a slim design that will fit most drum brakes, allowing you to adjust the clearance between the brake drum and the brake shoe. 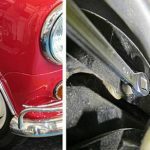 The wrench fill fit both ¼in and 5/16in square brake adjusters, making it suitable for many older kitcars including Mini-based ones. The tool is manufactured from hardened and tempered chrome-vanadium steel from strength and durability and is a useful 175mm long. A must-have tool for car maintenance and available now from your Gunson stockist with an RRP of £6.41 inc VAT. More details from www.gunson.co.uk ENDS. Print article This entry was posted by admin on November 2, 2018 at 10:38 am, and is filed under News. Follow any responses to this post through RSS 2.0. Both comments and pings are currently closed.